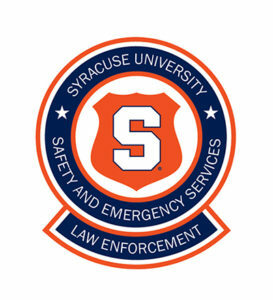 The Department enjoys a healthy working partnership with the Syracuse City Police Department and operates under an agreement with our city counterparts. This agreement provides common reporting methods between our two departments and also grants DPS permission to respond initially or jointly with the SPD to crimes involving students or taking place in specified off-campus geographic areas and public streets. Our Investigations and Crime Prevention Section works to solve crimes and document incidents reported to DPS, and the Department also provides extensive Crime Prevention materials, workshops, and public safety information to help stop crime before it happens. Topics covered in Crime Prevention presentations can be tailored to student, staff, and professional organizations’ needs. They can include anything from technological safeguards for computer security to bicycle maintenance recommendations. To request a Crime Prevention presentation, tabling at event, or relevant safety materials, fill out the Crime Prevention Event Request Form. The Department of Public Safety also believes that public information is the key to educated decision-making. Accordingly, we provide notice of any crimes reportable under the Jeanne Clery Disclosure of Campus Security Policy and Campus Crime Statistics Act to the University community. These Public Safety Notices are distributed via blast email, social media disclosure (on Facebook and Twitter), and posting to this website. In addition, we publish a Daily Crime Log which lists all reports made to the Department for the past 60 days.